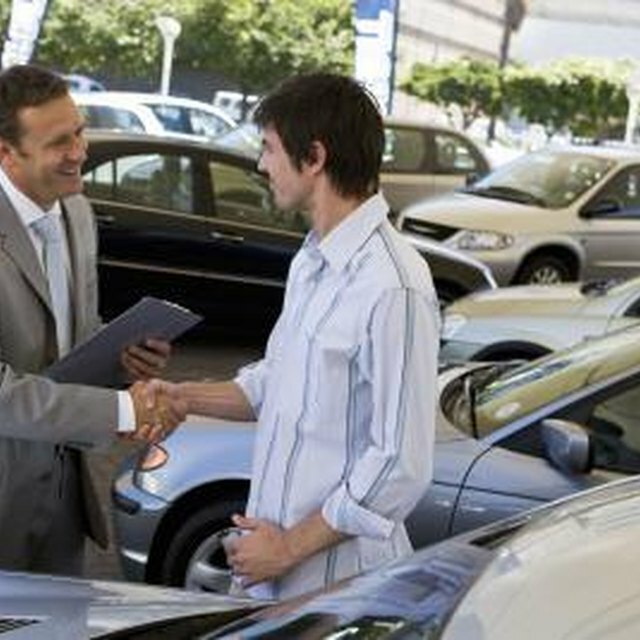 If you need a loan to buy a car, you must meet certain income requirements as well as have a good credit history. If you don't qualify, you'll need to find someone who does and is also willing to cosign for the auto loan. A young buyer will often need a cosigner because he lacks a credit history. Your cosigner does not need to be listed on the title or car registration associated with the vehicle for which you're obtaining a loan unless you request it. A cosigner is someone who has either good or excellent credit and is willing to vouch for the individual in need of a loan. With her signature, the cosigner is agreeing that if the borrower of the auto loan misses any scheduled payments, or stops paying altogether, that she is prepared to make the loan right. The financial responsibility for the vehicle will then fall on the cosigner's shoulders. When it comes time to sign the car title, a cosigner may be required to put her signature on certain documents. For example, the Maryland Department of Transportation's Motor Vehicle Administration states that if the car's owner is under the age of 18, a responsible adult, such as a parent or employer, must cosign the paperwork. The Maryland MVA points out that this does not mean the cosigner will appear on the title. The cosigner is needed in this instance to verify the accuracy of the information given in the document. While anyone who cosigns your loan has no legal rights to the vehicle you are purchasing, you may wish to voluntarily add the individual to the registration and car title. This shows the cosigner that you are sincere in your desire to pay off the loan, and it also gives the cosigner the ability to repossess the car if you default on the payments. This way, the cosigner can sell the car and use the money to pay off the loan, or use the vehicle while he is making payments. Once you've had the opportunity to pay down a portion of the vehicle loan and build up your credit score, you may want to consider removing the cosigner from the loan. There are two ways to do this: You can refinance the loan with your current lender, or you can look for a new lender that is willing to do the refinance. When you refinance, you are essentially applying for a loan in just your name. Keep in mind that you may have to pay a higher interest rate, which would make the monthly payment higher than what you were paying with the cosigner. Langley Auto Loans: Will I Need a Cosigner?